Even on a show known for its cold opens, this is one for the ages. The screen split vertically down the middle, DePalma style, Kim and Jimmy go about their increasingly separate lives. We see them walking through the same routine on different days, wearing different clothes: Jimmy puts toothpaste on Kim’s brush for her, then they each go to work: Kim at her new Schweikart-Cokely office, Jimmy at his deserted CC Mobile storefront. We understand their new work arrangements: Kim helping to open new Mesa Verde branches (after each one, she gets a a glass cowboy plaque for her shelf), Jimmy closing the store to handle Saul Goodman’s drug phone business (every day he wears a different garish tracksuit). We witness their intersections with the courthouse: Kim working prosecutors to get deals for her pro bono clients, Jimmy checking in with his probation officer. And through it all, the thick black line down the center of the screen never goes away, even when they’re sleeping in the same bed, or eating side by side at the kitchen counter (one particular shot where Jimmy pours wine across the line is a nice touch). At the end of the sequence, the sides of the screen fade out in reverse of how they faded in, and Jimmy is left in bed alone, with his back to the blackness where Kim was just sleeping, wakeful and unhappy. But this beautiful sequence is doing some heavy lifting for the show, while making it look absurdly easy. It moves us forward in time about eight months, from early summer 2003 to January 2004, bringing us close to the end of Jimmy’s probation. We see time pass with the accumulation of glass cowboys in Kim’s office (shot from behind the shelf, looking through them to Kim reaching up to position the next one, a lovely camera placement), and with the dates typed on Jimmy’s probation forms. And as the episode moves from storyline to storyline, we realize that Jimmy’s regaining his law license is only one of the events the show has placed months in the future; Gus building the underground lab, and Hector’s rehabilitation, also were set up to take some time. So after we watch Jimmy and Kim waiting out that period, we find ourselves at a different place in those stories as well — further along, certainly, but also with a new set of problems. Hector is learning to tap his finger to communicate (the eventual “ding!” that will replace that tap is left to the viewer’s memory to provide), and as Gus monitors his progress with the John Hopkins doctor, he realizes that the lecherous old man is absolutely still in there. And the underground construction is going slowly and taking a toll on the quarantined German workers. Breaking Bad fans are surely thrilled to see Huell Babineux ascend to the status of Saul’s partner in crime in “Something Stupid.” He tosses a mean phone box, but isn’t really equipped to judge whether Kim’s going to like the house Jimmy’s picked out to serve as the offices of the resurrected Wexler-McGill partnership. (If Huell were a lawyer, he’d work in a glass high-rise “when I’m not on my boat.”) Huell’s behavior certainly fits the episode title, which is drawn from the song that plays over the cold open. Returning with lunch, headphones full of zydeco, just when a plainclothes cop is telling Jimmy to scram with his secondary mobile phone store (get it? the store is mobile, too! ), he whaps the threat upside the head and winds up arrested. Facing a couple of years in jail for assaulting a police officer, Huell plans to skip town, but Jimmy promises him they can keep him out of jail. And that’s where Kim’s public defender work crosses paths with Jimmy’s side hustle. One of my favorite moments in this stellar episode is the scene where Jimmy explains to Kim what he needs to get the charges on Huell kicked. Open on Jimmy explaining the incident (Huell, sandwiches, cop) in his usual fast-talking fashion, and then cut to Kim: “You’ve been selling drop phones on the street?” That cold open, all the time that passed — Kim knows nothing about Jimmy’s daily routine, month after month after month. What follows escalates the stakes on that separation. Kim tries to get a plea deal with no jail time, but because of Huell’s prior record and the fact that he had a history with the cop, the prosecutor won’t budge. So Jimmy all but states that he’ll be handling the Huell situation in extra-legal fashion: “You do your thing, I’ll do mine.” Jimmy leaves Kim with a terrible choice, between her professional obligations and their relationship. And when the credits roll, she’s made it. Instead of going to see Huell to deliver the bad news, she swings by an office supply store and loads up on markers and pens. “Whatever you’re doing, don’t,” she tells Jimmy on the phone. “I have a better way.” We’re left to wonder whether that better way will take her too far onto Jimmy’s side of the law and imperil both their livelihood and her public defender work, the cases that give her a reason to keep going. Maybe whatever Giselle’s cooked up will bring these two estranged lovebirds closer together in the short term. 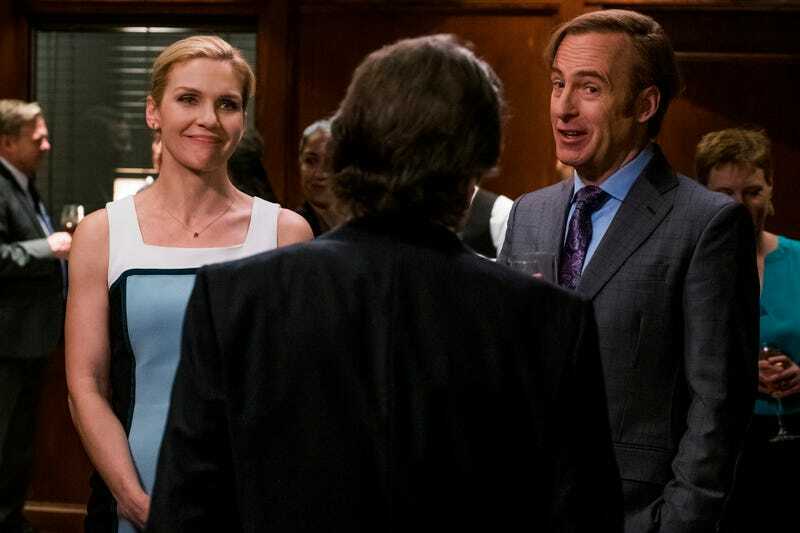 But it’s also likely to be her own “something stupid.” The long term looks grim for Kim Wexler. Eight months in, Werner says, and the workers know they’re only halfway done. (Enough time for Mike to pick up some German, which he reveals to our surprise to break up the underground fight.) They need, you know, R&R. Can’t wait to see Mike’s face as he is forced into the role of chaperon on a cathouse field trip. Jimmy just can’t help himself, can he? Kim brings him to the Schweikart-Cokely cocktail hour, and instead of just ingratiating himself with his gift for learning people’s names and playing life of the party, he indulges his resentment of the firm’s deep pockets. “Nnnnrrruuuummmm! I’m a private charter jet to Aspen!” Another “something stupid.” He’s worried about getting Kim back to the farm after she’s seen Paree, but showcasing his resentment of Paree isn’t going to do anything except drive them further apart. “They didn’t get D.B. Cooper,” Huell reasons as he mulls the odds of staying out of the reach of the law.